Probably the last of October and the beginning of November is the most depressing time for a gardener. Things stop producing, a quick freeze bites leaves and suddenly everything looks close to death. Kinda like me after a night on the town. Ah, dear reader, but that’s where the magic of a fall garden comes in. But let’s save that for later. Right now let’s check on how The Funny Farm is holding up. Let’s start with the things that are still producing and making me happy. 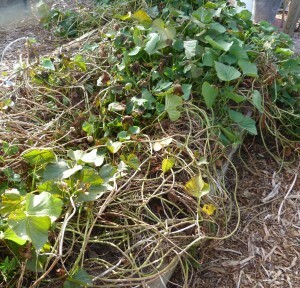 The vines are starting to die off as I dig up the sweet potatoes. They are still safe under the ground, even if a hard freeze gets the leaves, but they will stop growing. Here’s some of what this one great bed has given me. Now those are some Big Boys! There are still more out there I haven’t dug up because I can’t eat all these in a month anyway. I’ve been handing them out around town. Requests will probably pick up around Thanksgiving. Gobble, gobble. 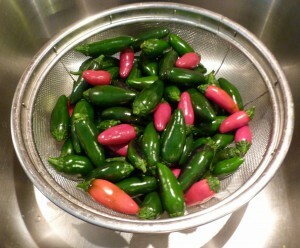 The peppers never did real well this year due to lack of real rain, I guess. They were pretty small all summer but after a couple of inches of rain at the beginning of October, they perked right up. 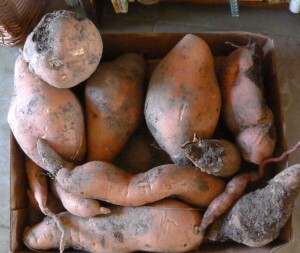 Unfortunately, we had a freeze the other morning, so the day before I went out and harvested everything I had. It was more than I had anticipated. 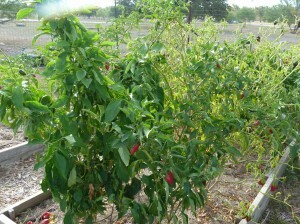 A gardening tip here: one of my girlfriends gave me a pimento pepper plant this year. Never had grown one of those before and they’re great. 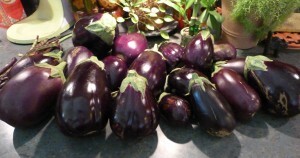 They are more heart shaped, have a nice thick wall, great flavor and easily turn a beautiful red. I recommend planting those next year. 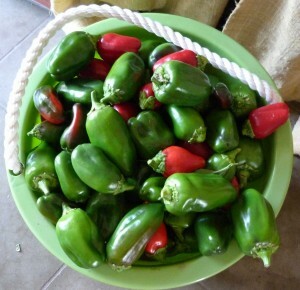 I also found a jalepeno plant called a Mucho Nacho and it has produced very well all summer, but these suckers are extra hot! Look what one small bush yeilded me on “cut” day. Well, they’re red and green, aren’t they? Finally, the one I can’t brag about enough. 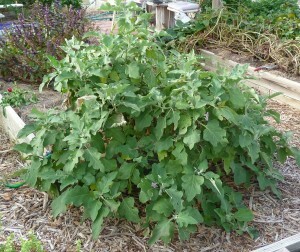 The Magical Eggplant Bush. It hasn’t died yet, but it’s on it’s way out. Look at this handsome guy. That’s what I’d call magical! On this particular day when I took the last harvest from my buddy here, look what I got. Wow! Tomorrow we’ll check the rest of The Funny Farm and see the hope for the future. Now go outside and enjoy this beautiful fall weather.